We deliver throughout the local area around the Branch Bros Branches Monday to Friday. A Saturday Delivery Service is also operated March to September from our Bourne Branch - Local Area Only, but please check availability at time of order. All Crane Off-load Deliveries operate out of our Bourne Branch, whether orders are placed at Bourne or Deeping Branch. 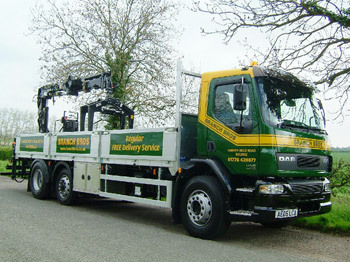 Holbeach operate their own Crane Lorry and Light Truck service. 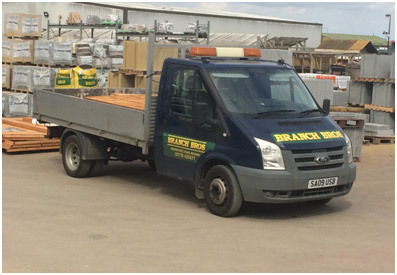 We also run a Light Truck Delivery Service (Light materials for hand off load) out of our Deeping Branch Monday to Saturday around the Local Deepings Area Only. Please refer to the table and further information below regarding the delivery areas we service on a regular basis. Our Delivery Service is Free on orders over £25.00 minimum value. Whilst we can specify a delivery day we are unable to offer a timed delivery service and therefore all deliveries will usually be made during our normal working hours. The vehicles are loaded the night before so we would have an idea on time in the morning if information is required please contact the Bourne Branch for details on your delivery. We can however call you prior to your delivery on the day to advise when likely to expect our driver if required - please mention this to our staff at the time of order if required. You will then receive a call from us on the day of your delivery. If you need to contact us about your delivery please contact the Branch delivering your goods on the numbers as shown above. Baston, Bourne, Cawthorpe, Edenham, Glinton, Haconby, Hanthorpe, Helpston, Langtoft, Lound, Maxey, Morton, Northborough, Northorpe, Peakirk, The Deepings, Thurlby, Toft & West Deeping. LOCAL HOLBEACH & SPALDING AREA - DAILY SERVICE MONDAY TO FRIDAY Incorporating: Long Sutton, Fleet & Hargate, Lutton, Gedney & Dyke/Drove End, Sutton St James, Whaplode & St Catherine, Weston & Hills, Moulton & Chapel/Seas End, Holbeach Bank/Hurn/Fen/St Marks/St Matthew/St Johns, Dawsmere & Cowbit. WISBECH AREA - TWICE WEEKLY SERVICE (Tuesdays & Fridays) Incorporating: Sutton St James, Parsons Drove, Murrow, Gorefield, Throkenholt, Holbeach Drove, Whaplode Drove & Shepeau Stow. KINGS LYNN AREA - TWICE WEEKLY SERVICE (Mondays & Thursdays) Incorporating: Sutton Bridge, Walpole Cross Keys/St Andrews/St Peter/Highway, Clenchwarton, Terrington St Clements/St John, Tilney All Saints/St Lawrence & West Walton. BOSTON AREA - ONCE A WEEK (Wednesdays Only) Incorporating: Fosdyke, Sutterton, Algakirk, Kirton, Wyberton, Wigtoft, Bicker, Swineshead & Donington. DOWNHAM MARKET** - ONCE A WEEK (Mondays Only) Incorporating: West Winch, Watlington, Denver, Upwell*, Outwell* & Emneth*. MARCH** - ONCE A WEEK (Tuesdays Only) Incorporating: Elm*, Friday Bridge*, Coldham, & Guyhirn. *Potential to incorporate into Wisbech run - please check with Holbeach Branch.